DNA Can it help me with my Genealogical Research? Eddie’s High School Annual, a find of 2015! ← The McDonald’s find work in Tuscor, MT 1924-25! Eddie’s “Collection of Junk” – Brother Gordy early 1920’s! Eddie’s Collection of Junk scrapbook had a few artifacts that featured her older brother Gordy. He was formally named Ronald Gordon McDonald and get’s confused with his father Ronald Sandfield McDonald. He was always “Uncle Gordy” to me. While Vivian was graduating from Cheney High School and attending the Normal School, Gordon was also growing up. Vivian was the oldest and Gordon followed her. They were older siblings of Keith the subject of this blog. I love this picture of Gordy, his hat and his outfit in the following photograph. 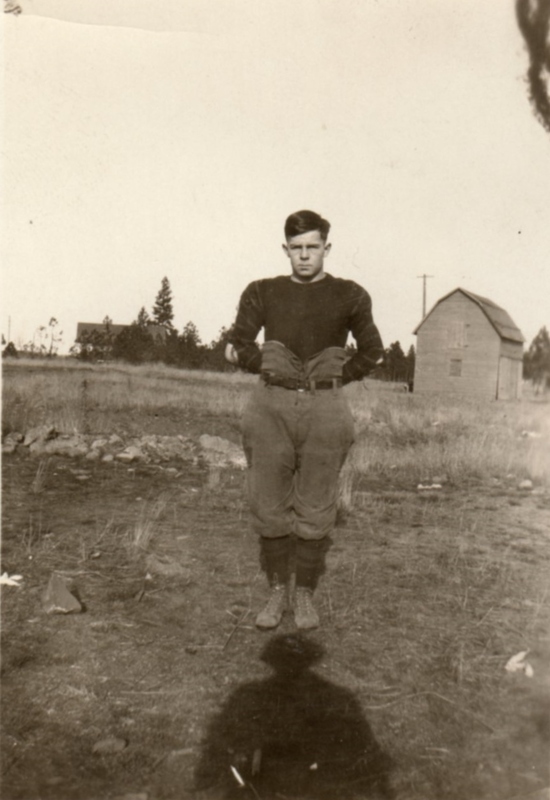 The following photograph shows Gordy in what I would call a football uniform and it was probably Cheney High School 1921. Gordon and brother Keith were built almost exactly alike. They were both about 5 feet 4 inches tall and about 150 lbs. so they were not big men; however, they were stocky built. Here we see Gordon with a full head of hair. It wasn’t going to last, eventually, both brothers would become bald but not till the mid 1930’s. If you look at the shadow in this photograph in front of Gordon it looks like a girl took the picture? 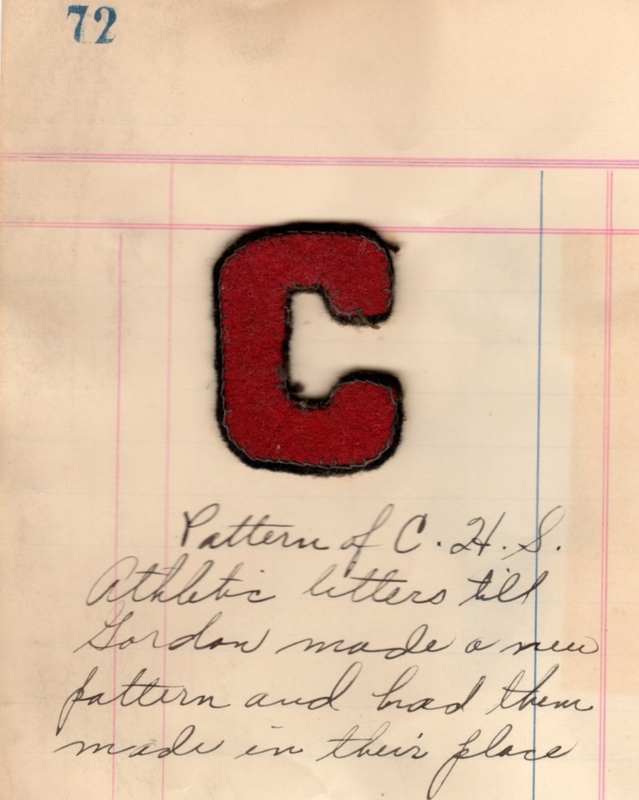 Eddie writes about the Athletic Letter in the photograph below. I am not sure she was happy about it, but apparently brother Gordon interfered? More about Eddie’s involvement in sports in a future post. Below is what looks like a graduation picture of Gordon. I lean toward it being his Cheney High School graduation picture because he is younger looking. Eddie had a rusty button that she kept among her memorabilia. From what I can determine the Older Boys Conference might have a connection to church activities. 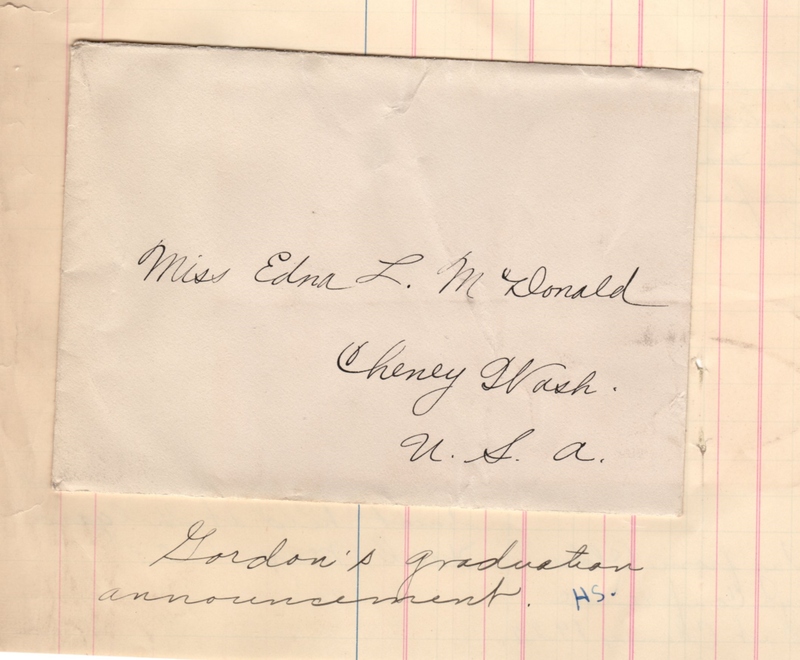 Below are two pages from the Kinnikinick Yearbook in 1923 for the Normal School now Eastern Washington University in Cheney. I do not know what the Senior B Class means but Gordon is listed in the 3rd column eighth one down. I do not see him in the picture. 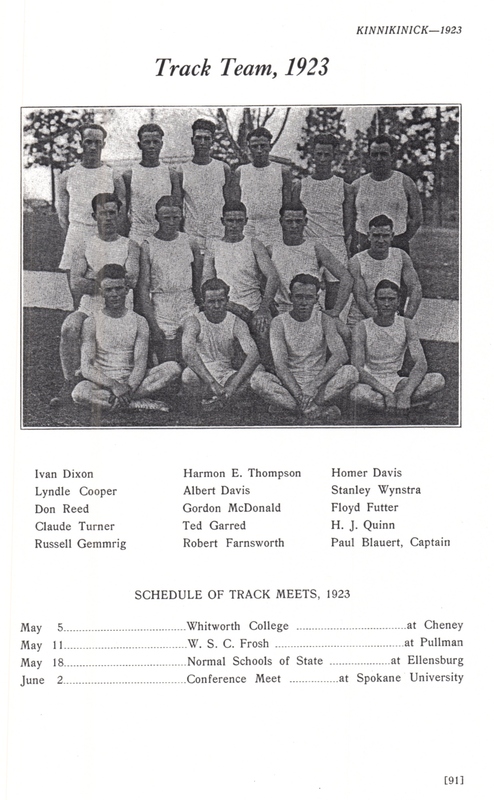 This other page from the yearbook for the Normal School dated 1923 shows Gordy with the track team. He is in the front row second from the left, seated. He was so serious in those days. 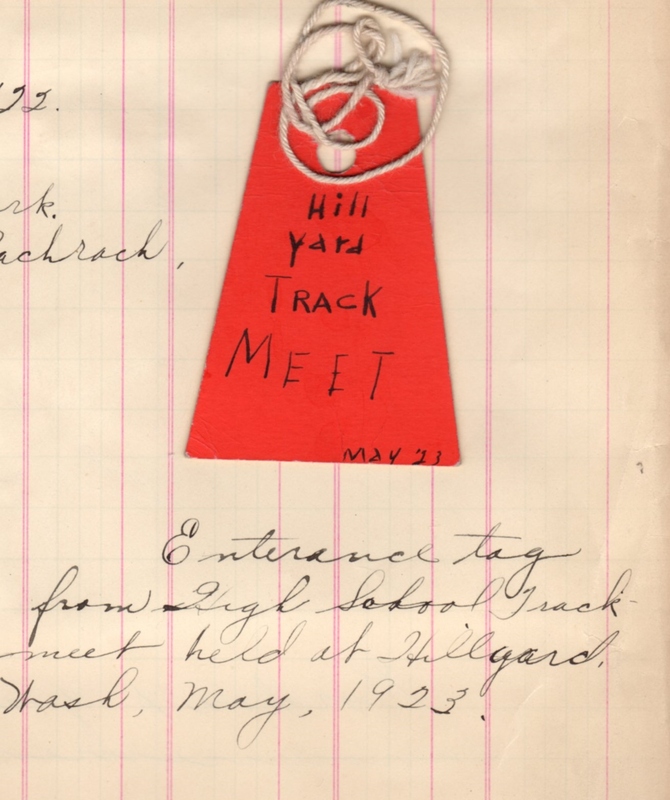 Eddie had this ticket for entrance into a track meet in 1923. 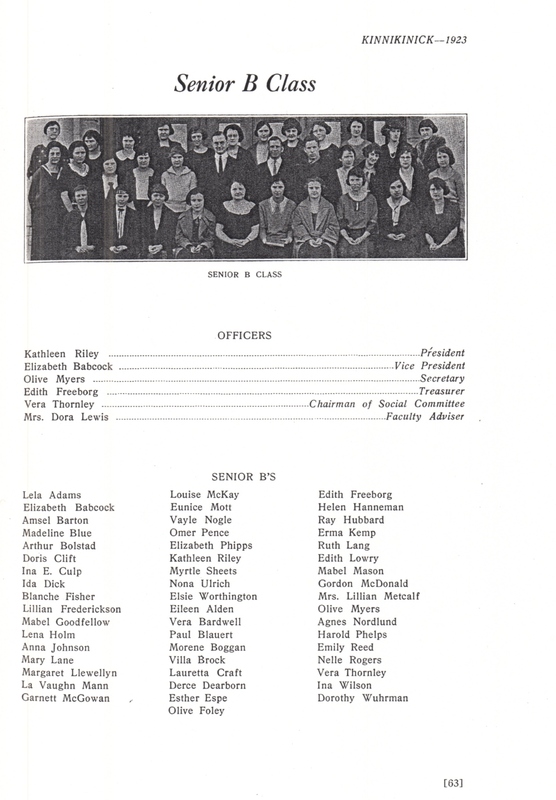 It is not listed on the yearbook page above but it might be one that Gordy participated in or maybe they attended together? It does mention High School and he was out of high school by about 1921. 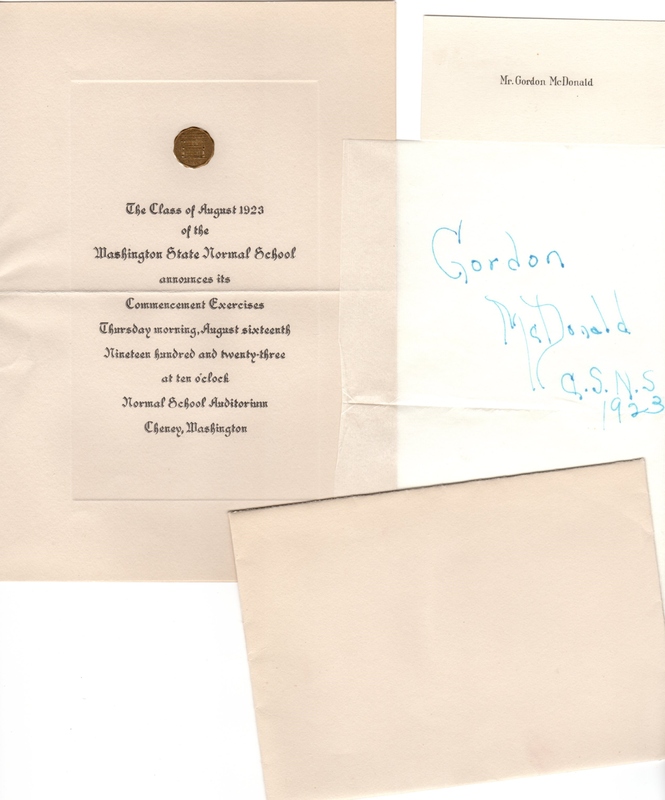 Eddie saved her brother Gordy’s graduation envelope, announcement and cards in her “Collection of Junk.” This is from Gordon McDonald’s August 1923 graduation from Normal School. Here we have a photo of Vivian and Gordon with parasol’s. 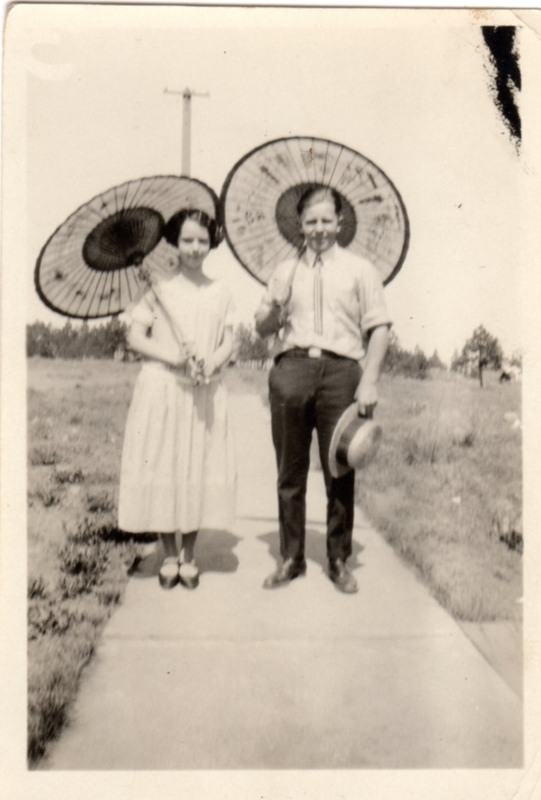 These parasols seemed to be a big thing in the early 1920’s. Vivian and Gordon 1925 with parasol’s. This photograph was taken in about 1925 of Gordon. He is with someone who he seems to be very friendly with for he is smiling. I am wondering again if this is not Claude Penglase? Claude Penglase was to marry Mary Helena McDonald, Angus’ daughter. Angus was Gordon’s Uncle. 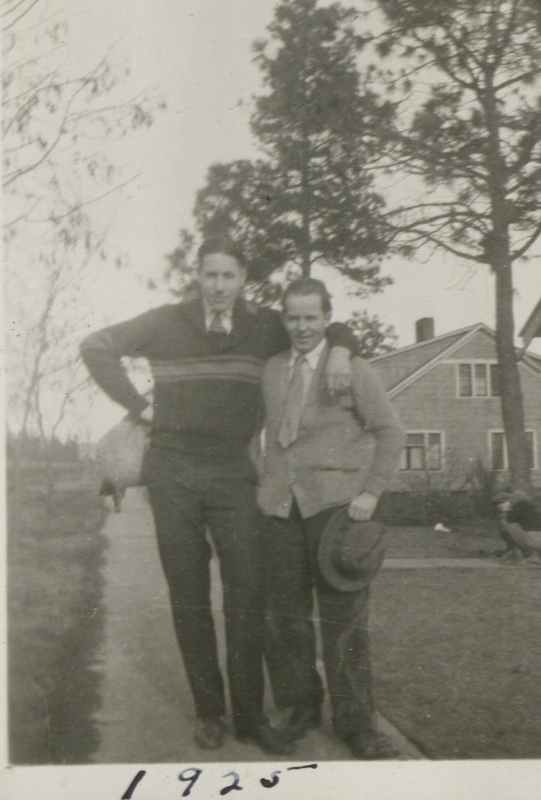 In 1926 Gordy was living in Seattle, Washington which sort of strengthen’s the theory that the boy above is a Penglase. 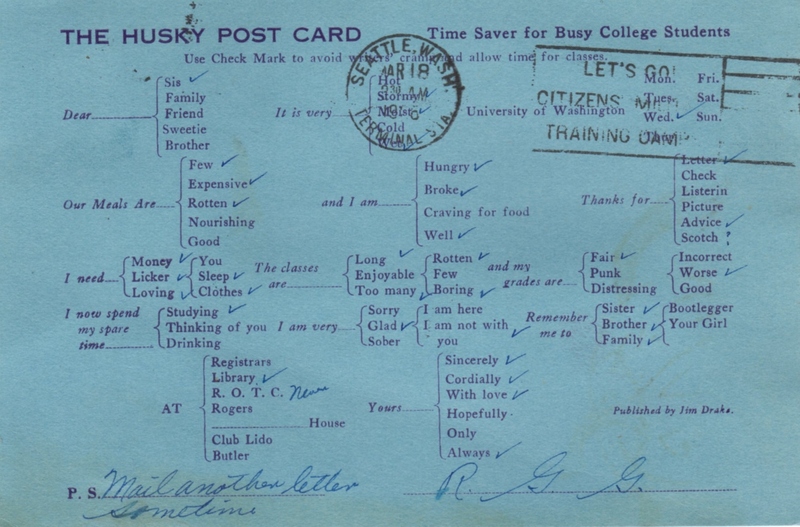 Gordy sent this postcard to his sister Eddie and she kept it! 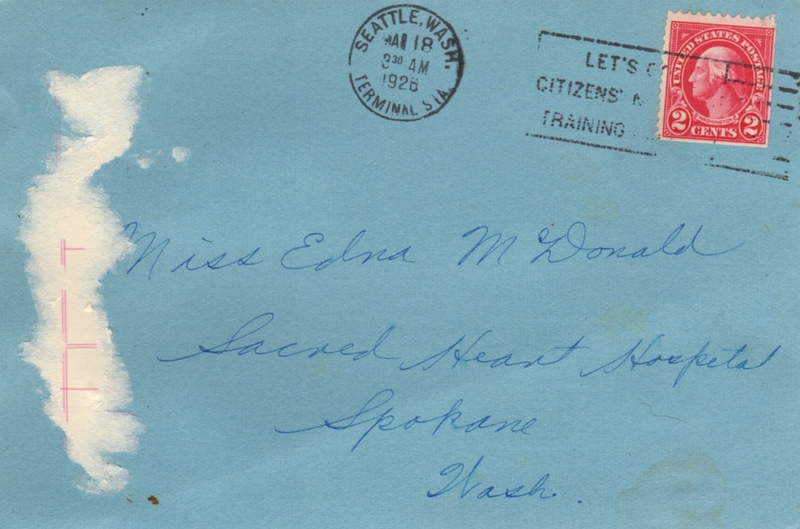 It is addressed to Sacred Heart Hospital in Spokane, so it shows the transition of the family from Cheney to Spokane by 1926. Tracking my Uncle Gordy has been a challenge. Single men move around and he definitely was on the move in the 1920’s and 1930’s. Gordon did not marry till after 1950. When his mother Grace died, Gordon became the older brother who watched over everyone. 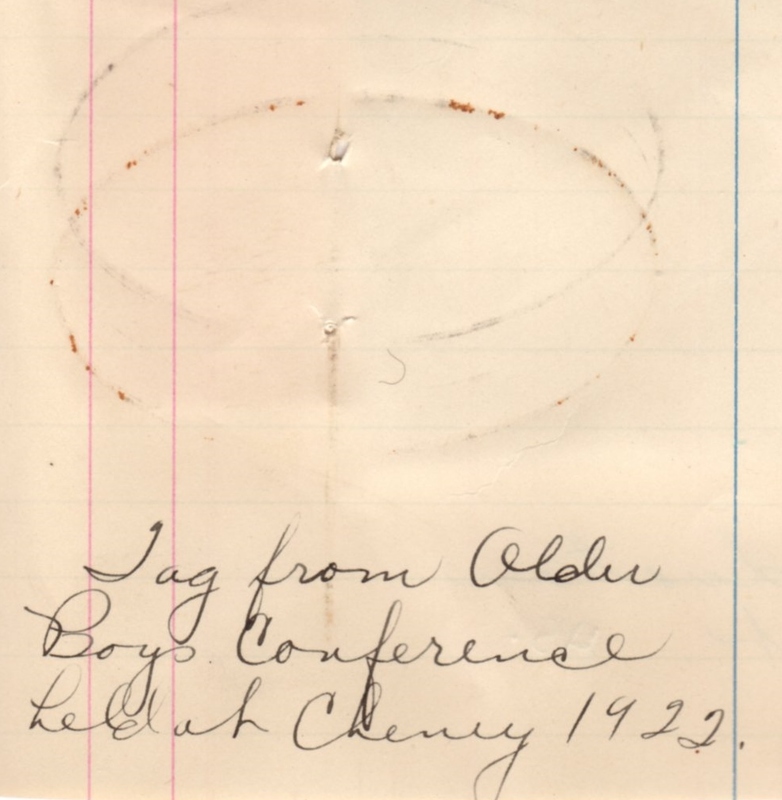 This entry was posted in Cheney, Eddie L. McDonald & her Collection of Junk, Gordon McDonald, GRACE & RONALD MCDONALD, Helena Mary McDonald & Claude Penglase, Keith B. MacDonald, King County, Minneapolis/St. 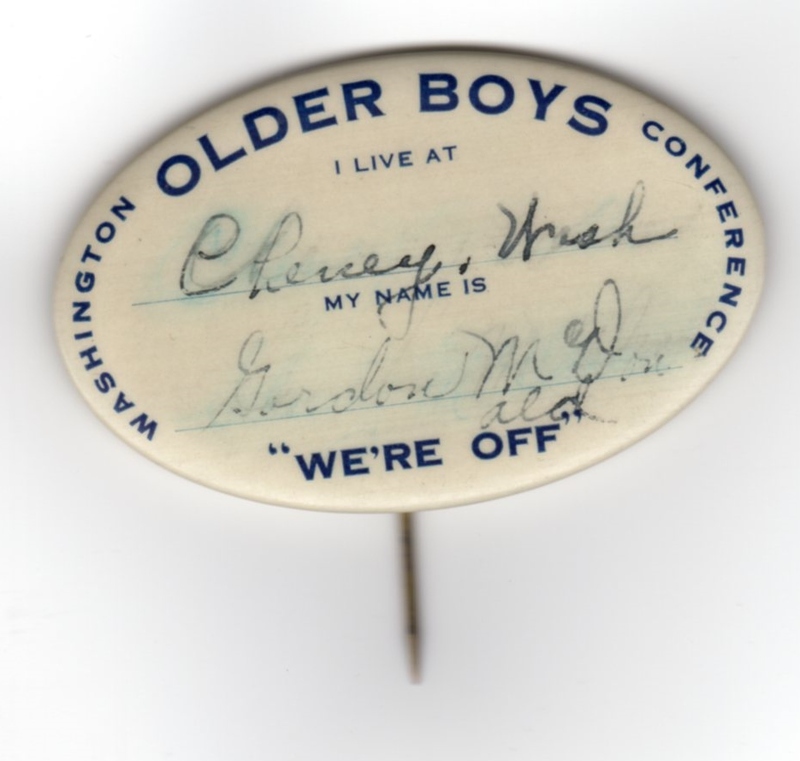 Paul, Minnesota, Miriam's Notes, Seattle, Vivian McDonald McKanna, Washington State and tagged A Collection of Junk, Cheney High School, Normal School, Older Boys Conference. Bookmark the permalink. As of 9/17/2018 I have been informed that the St. Alphonse Cemetery in Chapeau maybe in jeopardy of being destroyed. I tried to photography many photos and put them on Find A Grave, I also made sure that the two cemeteries were separately done. I am talking about the one in Chapeau next to the Catholic Church, not the one 1/2 mile south of the town. I do not live in the area of the church and cemetery and can’t get more photos done. We need help getting that cemetery documented with photos.  E. Brown did the book years ago on the burials and stones but we need help now. If you have family and ancestors buried there be advised that the stones maybe in jeopardy. Header photo is of Armadale Castle on Isle of Skye May 2018. 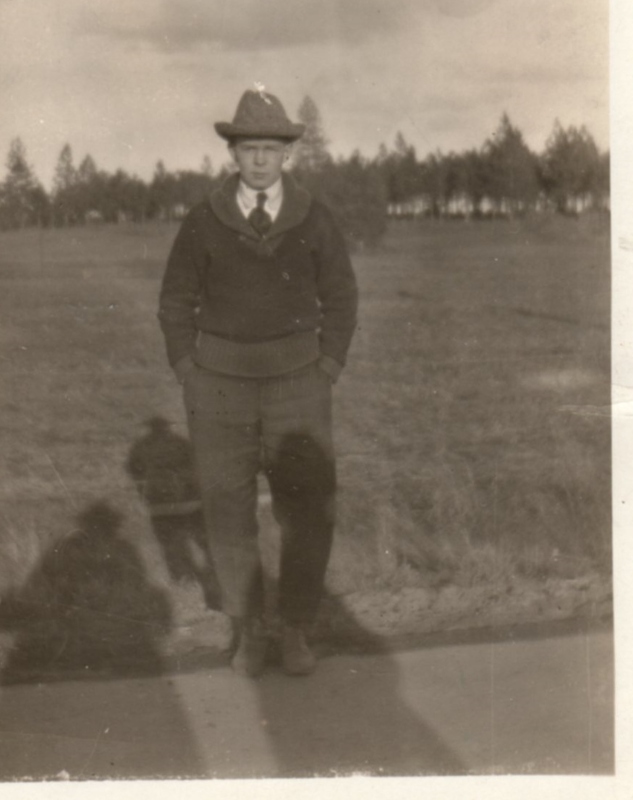 As of 9/1/2018 I have added 3 new photos courtesy of a cousin to Daniel Kennedy and Jane Wilhemina McDonald – a daughter of Jeannette and Angus McDonald. Check them out! There is a table of contents of the posts about my trip to Scotland in May 2018 at the top of the blog under the header photo in the drop down for Seaching for the origins of the MacD’s. Find My Past has a section for searching on Scotland, Jacobite Histories 1715-1745 and there is quite a list of documents including some of the forfeited estates, histories of the rebellions and more. July 7, 2018 Went to Port Townsend, WA and we had breakfast at the Spruce Goose Cafe at the Jefferson County International Airport. We also spent time in the Pt. Townsend Aero Museum next to the cafe. I highly recommend it. Both have websites just Google them. As I sat in the Spruce Goose Cafe enjoying my breakfast I had this feeling that I had been there before with my dad, Keith, who loved the airplanes. Solomon Goss of Fearing Township In Ohio! The Boardmans and Browns of Winnipeg, A Canadian Story! This blog was started on January 30, 2010.